Growing older means getting wrinkles. The natural elements that keep our skin looking youthful eventually come up short, resulting in less flexibility and elasticity and ultimately leading to the formation (and deepening) of lines and creases. Although these changes are basically inevitable, there are ways to smooth out wrinkles that have formed. The ideal strategy depends on what caused the wrinkles in the first place. Facial lines and wrinkles that appear due to facial muscle movement respond best to injectable neuromodulators. 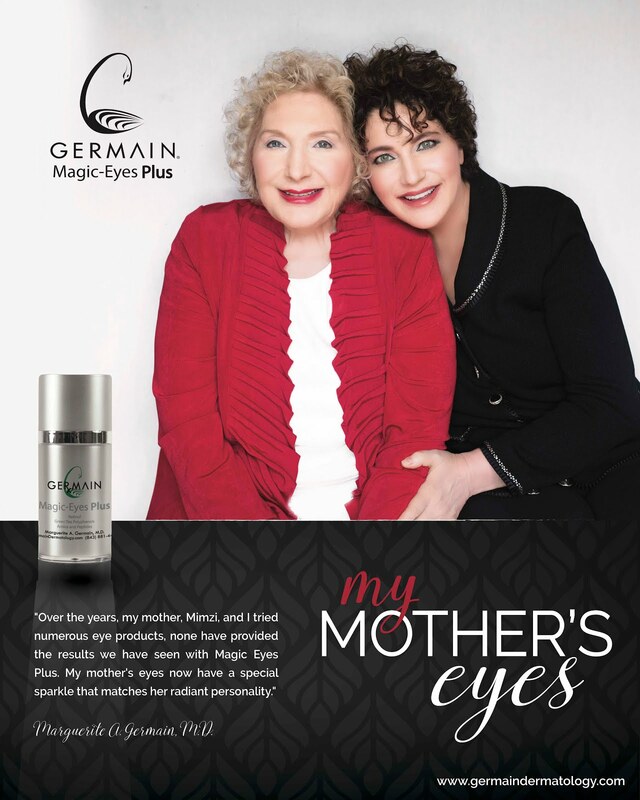 These include DYSPORT®, XEOMIN®, and BOTOX® Cosmetic at Charleston’s Germain Dermatology. The team offers all three FDA-approved injectables to address crow’s feet, frown lines, and other wrinkles. Each injection contains a small amount of purified botulinum toxin. The prescription cosmetic is injected into specific muscles that cause the formation of facial lines and wrinkles. The active ingredient causes the muscles to relax so the skin sits at rest instead of moving into folds. As a result, facial lines are less visible—and can even diminish over time. It’s important to remember that not all wrinkles are the same. In addition to “dynamic” wrinkles that appear due to the repetitive pull of muscles when making certain facial expressions, there are also “static” wrinkles that form on the face due to age-related loosening and a decrease in skin moisture as collagen, hyaluronic acid, and elastin diminish. 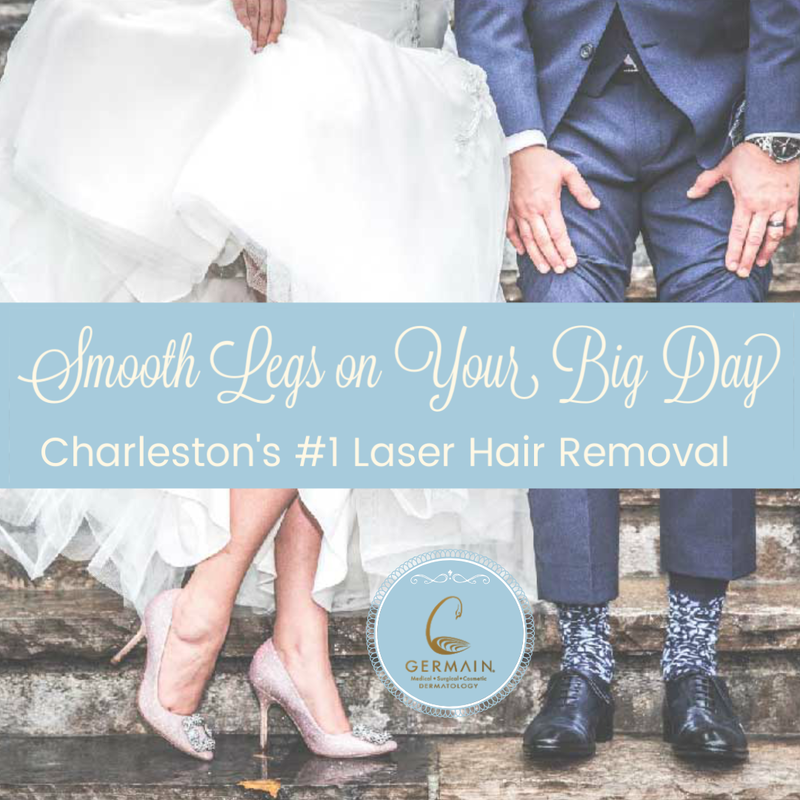 The team at Germain Dermatology has extensive experience with neuromodulators and understands that each Charleston-area patient has a unique goal and expectations. A professional assessment is essential so your injector can recommend the ideal treatment, whether BOTOX®, DYSPORT®, or XEOMIN®—or another strategy entirely. Results from neuromodulator injections are temporary, with effects lasting up to three to five months—though initial visible improvements are noticeable within three to seven days. An added benefit of repeated treatments is that results tend to last longer. BOTOX®, DYSPORT®, and XEOMIN® injectables have proven over and over again to be an ideal cosmetic solution for restoring the look of more youthful skin. Find out more about options for smoothing out wrinkles, including BOTOX®, in the Charleston, SC, area by calling Germain Dermatology at (843) 881-4440 or sending a message online. Why Wear Sunscreen When It’s Cloudy? The Germain Dermatology team takes skin health very seriously, which is why our dermatologists encourage men, women, and children alike to stay alert throughout the winter to minimize their risk of skin cancer. Charleston, SC, has its share of cold, cloudy days, but do not be fooled into thinking that a hidden sun means the danger of ultraviolet radiation is hidden, too. Fortunately, rain and cold weather tend to prompt people into covering up, but any exposed skin is still at risk of being harmed by the sun if exposed to the sky—overcast or not. Invisible ultraviolet radiation is not stopped by cloud cover, meaning it continues to impact everything it hits, including faces, hands, arms, scalps, and more. Damage can appear as everything from premature signs of aging (including wrinkles, spots, and more) to cancerous lesions that may require surgery to remove. Prevention is the best way to stay healthy and beautiful, so be sure to wear sunscreen when going outside, whether the skies are blue or gray. Remember, too, that not all sunscreens are the same, so be sure to find one that is both effective (minimum SPF 30) and feels comfortable on the skin. There are non-greasy formulas and other options, eliminating any excuse used to try to get out of wearing a protective layer. Your sunscreen should contain a physical block. Zinc oxide is the best. As during the summer months, when sunscreen is often at the top of everyone’s mind, apply it about half an hour prior to going outside to be sure it has time to start working properly. Also, remember that sunscreen loses its effectiveness over time after it has been applied—and even more quickly if water washes it away. Re-apply as necessary. Being sun-smart all year round can do wonders for the look and health of your skin. Find out more about preventing, diagnosing, and treating skin cancer in the Charleston, SC area by calling Germain Dermatology at (843) 881-4440 or sending a message online. Voting for Best of Charleston ends March 5th - go to www.BestofCharleston.net to vote today! Ditch the razor, embrace the laser. Laser hair removal isn’t a new “thing.” Chances are you’ve heard about it from someone, or seen advertisements for it or maybe you’ve even thought about giving it a try. Its established reputation for being an amazing, life changing addition and treatment should be reason enough to ditch your razor and embrace that laser, but we are still going to give you the low down on why you need laser hair removal and what you need to know about it. First things first, let’s chat about how this process actually works. This is performed by trained specialists only. Pulses of highly concentrated light are emitted from the lasers into the hair follicles. The pigment in the follicles absorbs the light and then destroys the hair. It takes a few times to get through all cycles of growth because only follicles in the active growth phase absorb the heat when the light hits the skin. Because of this, one treatment will affect 85% of the hairs in the targeted area. Some lasers are suitable only for light-skinned patients with dark hair, however at Germain Dermatology, we have the GentleYAG and GentleLASE, both of which work for light-skinned and dark-skinned individuals. A big dilemma for people when it comes to this procedure is the cost. Years ago, the cost for the treatment was much more expensive and could run thousands just for one appointment. It was also a much newer process so it wasn’t nearly as common. People couldn’t imagine spending thousands of dollars for something they weren’t even sure would work, or last for that matter. Now, the cost is less, but still dependent on the size of the area you are looking to have hair removed. If you want your legs treated, it’s going to be much more money than just getting your underarms. At Germain Dermatology, it’s $600 per treatment for full legs and $300 for lower legs only. It’s $250 per treatment for the bikini line and $150 per treatment for underarms. You can always call in and find out the cost for any other areas you are looking to have hair removed, but these are the most commonly sought after. Even though you’ll be paying some money up front, after you’ve completed the appropriate amount of appointments your results are permanent, so you won’t be paying for long. Plus, you won’t be buying razors any more, and think of all the time you’ll save without having to worry about shaving. Next up; pain, pain go away. Several people who decide to commit to the laser were previously avid waxers. If waxing isn’t a painful upkeep, I’m not sure what is. The good news is, laser hair removal is considered half as painful as waxing. Of course, everyone has a different pain threshold, but the process is relatively easy and is compared to a quick prick on the skin over and over during the treatment. Each body part you have the removal will feel different since as you know each area of skin has different sensitivities. Each treatment will be less and less intense, too, as the hair is eliminated, so you can expect any sensitivities you may have to dwindle down as time goes on. Here’s what you can expect for your hair removal appointment. First things first, you need to set up a consultation prior to any procedures, which is free of charge. Then, once we establish what you’ll be having done, you can get a price for your treatments and set up your first appointment. You should not pluck, wax or shave for the six weeks leading up to your laser hair removal and it’s also recommended you avoid sun exposure on the area during that time as well. You can use sunless tanners but should stop applying these products up to two weeks prior. You should shave the area to be treated 24 hours before your procedure. You can remove hair pretty much from any area. Common spots are legs, underarms, bikini area and facial hair. If you don’t want your entire leg done you can also do lower legs only. Call us for more. It's been making headlines as one of the hottest treatments to sculpt your abs and buttocks. 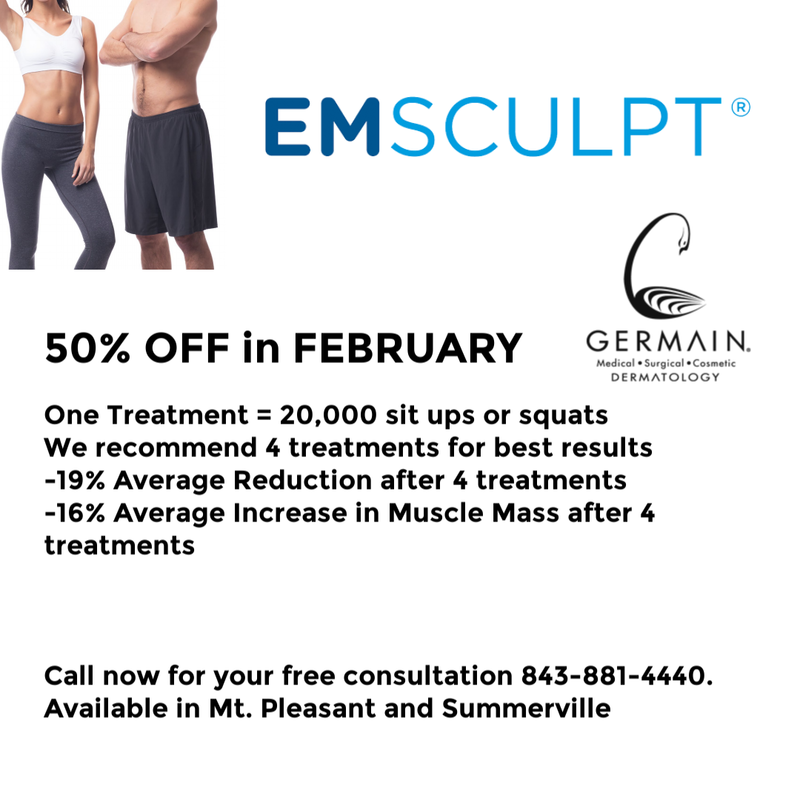 EMSCULPT has become a favorite of celebrities, models, personal trainers and anyone looking to lift and tighten. 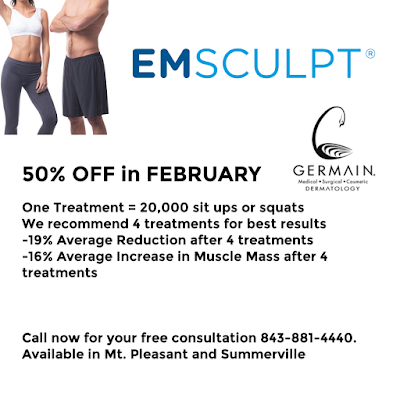 As the first to offer EMSCULPT to Charleston, we're proud to offer this special discount of 50% OFF Emsculpt for the month of February 2019 - available at our Mount Pleasant and Summerville offices. 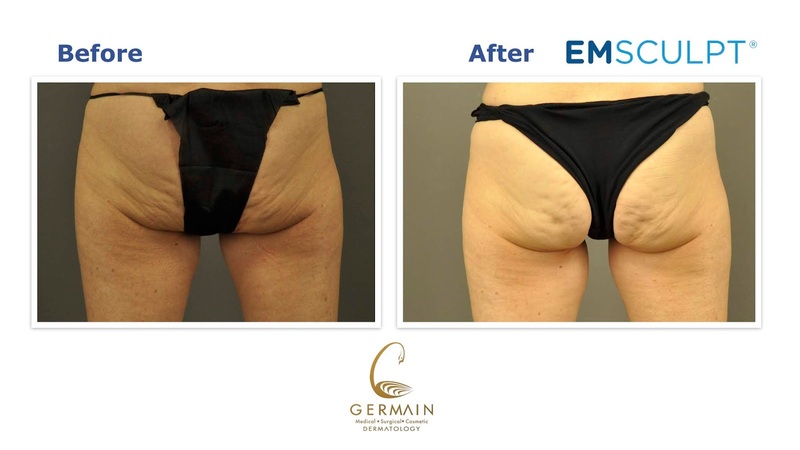 Call today for your free consultation -- and check out our results! 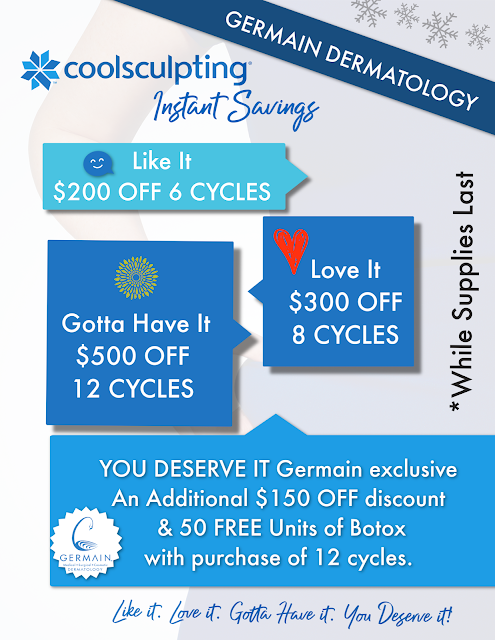 COOLSCULPTING Instant Savings is happening NOW and Germain Dermatology is adding even more savings on TOP! 💙💙💙💙YOU DESERVE IT (Germain Exclusive) - An Additional $150 OFF AND 50 FREE units of Botox when you purchase 12 cycles. 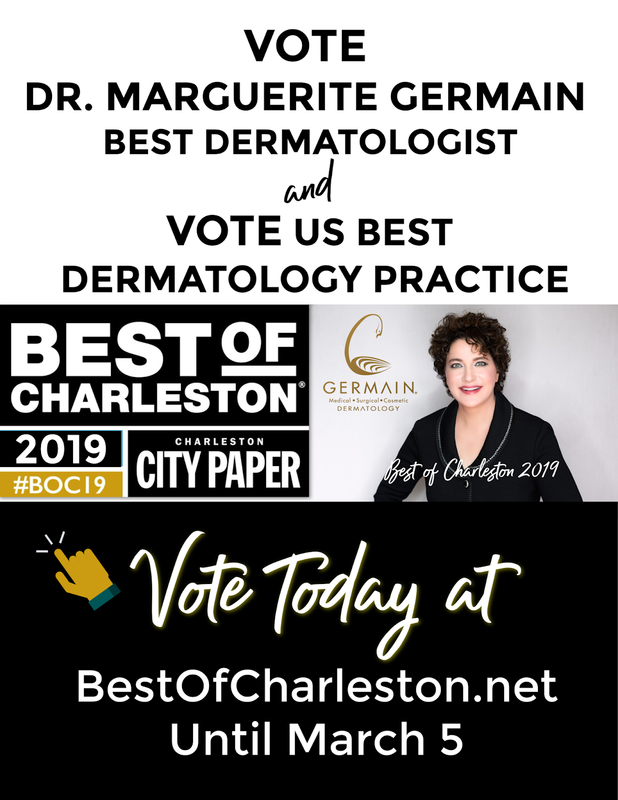 Dr. Marguerite A. Germain is a board certified Dermatologist specializing in all aspects of caring for the health and beauty of the skin. Voted best Dermatologist in Charleston, S.C. for 13 consecutive years, she is a national and international educator for Lasers, Fillers and Botox. Along with her experienced staff at Germain Dermatology, Dr. Germain strives to help educate those about the latest options in looking refreshed and why taking care of your skin is so important. With two Germain Dermatology offices in the Lowcountry - Mount Pleasant and Summerville - it's easier than ever to take care of your skin.